“It was a special treat to get to work with this family. Chantale and I actually went to high school together, and after graduation we parted ways and didn’t stay in touch. Ten years later, we both moved back to our hometown, bought houses on the same street, and got hired at the same place without realizing any of it! While we’d never really been friends as kids, we found ourselves growing together through the bond of motherhood, connecting over the sweet and the bittersweet, over love and loss. When she reached out to me for a family session, my heart leapt! Her dear Marek is full of life and joy. His silly antics and sweetness toward his mama are so similar to my relationship with my toddler, it made me teary-eyed to be able to capture those tiny moments for her, knowing how I’d cherish them if the roles were reversed. There were several moments during this family session that I had to fight back tears because seriously, time please slow down! It’d been a while since I saw the Packard family, and overnight these sweet little ones have grown from babies to big kids. In my mind, Marek will always be a tiny toddler with the most beautiful curly blonde locks I’ve ever seen. It feels like yesterday (cliche, I know, but it does!) that sweet Bricelyn was constantly snuggled up to her mommy in a baby wrap; so peaceful and petite you might not even know she was there if you didn’t look for her. So many precious moments during this session made me yearn to be able to stop time. Like when Marek, unsolicited, squeezed his little sis in for a kiss, or wrapped his mom up in a bear hug. Or the way he beamed when his momma straightened up his bowtie, and all I could think about was how in a blink she’d be doing the same thing for his high school prom. And sweet little Bricelyn running ahead of us on the trail, eager to find blackberries to snack on and the way she always held onto her daddy’s ring finger with her tiny hand at every given opportunity. Watching this family interact reminded me of a loaded question ~ if you could have one superpower, what would it be? My answer has evolved over the years. The ability to fly (hello. 5 year old self.) The ability to heal. The ability to cook a decent meal. There are lots of superpowers I wouldn’t mind having. 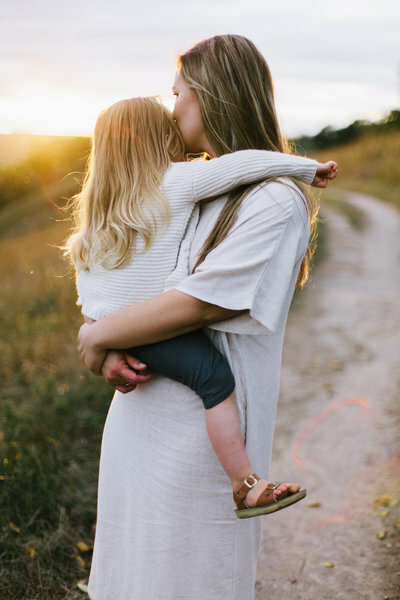 However, motherhood has recently shaped a new superhuman desire ~ the ability to traverse time ~ to relive the in-between moments and the moments that seemed small, but in hindsight are really everything. While I can’t traverse time, I am so thankful to have a job where I can momentarily stop time by capturing still images of moments like these. There’s something extra special about photographing someone you know personally. Although the truth is now that I’m a mom, I feel connected to every mom I have the privilege of photographing. Whether we know each other or have just met, it’s like our hearts speak their own silent, beautiful language that no one else can fully comprehend. I know how precious the sweet snuggles are; the ones that last half a second but that you wish you could hold onto for the rest of your life. I know the way you gaze onto those little chubby baby hands and wish the dimples would stay there forever; the way you stare at those long eyelashes (half with envy, but mostly in awe) and the way those big eyes melt your heart instantaneously.